In what amounted to a short day at the office for quarterback Blake Bortles, the Jacksonville Jaguars utilized a 31-point first half to secure their first playoff berth since 2007 with a 45-7 victory over the Houston Texans. Bortles threw three first half touchdowns and fullback Tommy Bohanon scored two 1-yard touchdown runs in the route as the Jaguars defense held Houston to just 186 total yards of offense. Jacksonville, or colloquially known as Sacksonville nowadays, brought down four sacks and an interception on defense, limiting the Texans to a mere 3.3 yards per offensive play, while their offense averaged 6.8 of their own. With that, we give you our PFF-exclusive takeaways from the contest for each team. 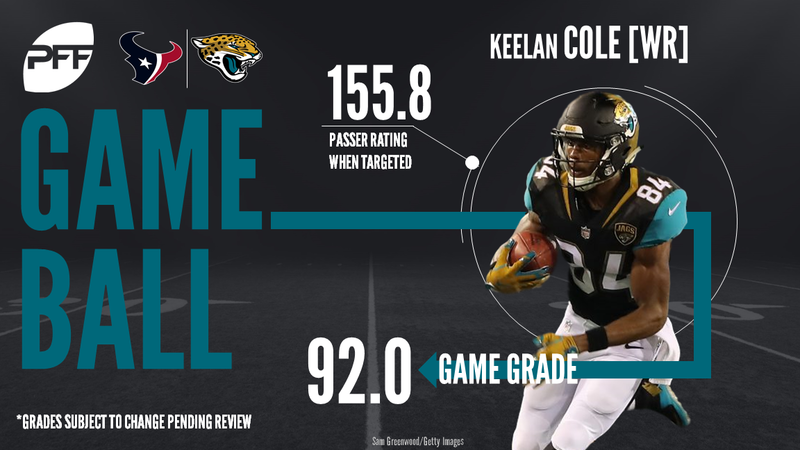 With the Jaguars wide reciver corps banged up coming into and during the game, they needed someone down their depth chart to step up and Cole did just that. He was absolutely brilliant, catching seven of his nine targets for 186 yards, 101 of which came after the catch. When targeted, Blake Bortles’ passer rating was a whopping 155.8. Bortles was near perfect against the Texans on Sunday as he only threw four incomplete passes that were not throw aways. Bortles threw for three touchdowns and did not have a turnover worthy throw in the game. On deep passes that traveled 20 or more yards in the air, he was a perfect 3-of-3 for 114 yards. On Bortles’ 16 dropbacks where he was not pressured, he finished 14-of-16 for 230 yards and two touchdowns for a perfect 158.3 passer rating. Ngakoue put on a show rushing the passer, compiling three QB hits and a QB hurry on 27 pass-rushing snaps, including popping a T.J. Yates pass into the air across the middle on one of his hits. His pressures came equally against both the Texans left and right side of the offensive line as his speed rushing the passer was clearly a problem for the Texans pass protection. Covering the slot position, Colvin yielded only two receptions on three targets thown into coverage totaling just nine yards on 27 snaps coverage. The Jaguars defense as a whole was fantastic as Barry Church was also splendid in the secondary as well. Hopkins had 10 passes thrown his way (five catchable) and he finished with four receptions for 80 yards and a touchdown. Hopkins and Jaguars defensive back Jalen Ramsey went head-to-head on the day with the advantage going to Hopkins. He caught a deep pass on a double move and also had a great catch on a ‘go’ route for a touchdown both coming against Ramsey’s coverage. Yates finished his day highlighted with a touchdown, an interception and two dropped passes. The former UNC Tar Heel was sacked four times and Houston’s offense had trouble finding any rhythm with Yates finishing 2-of-8 when using play action for 25 yards. He completed just four of his 11 passes under pressure for 40 yards, continuing the struggles on the day. Overall it was not a good day for the Texans defense, but McKinney showed up well in run defense, accounting for three stops on the day in 29 snaps against the run. McKinney finished with an 85.4 run defense grade, but was also proficient in coverage only allowing 16 yards on four catches in 25 coverage snaps, grading out at 81.0 in coverage.